A-HOTEL.com - Luxury and cheap accommodation in Atkarsk, Russia. Prices and hotel, apartment booking in Atkarsk and surrounding. This indicative offer was derived from the most recently booked accommodation in Atkarsk and sort by the price, from cheapest Atkarsk accommodation to the most expensive hotels. To select accommodation by your preferences we recommend to choose from 1 accommodation offers in Atkarsk in total. By entering the dates of your overnight stay in Atkarsk and using the filter tools you can sort the best possible accommodation for you. The entered dates of your stay are crucial for the most accurate offer as it derives all the online information on pricing and availability of Atkarsk accommodation. Then you can book the selected Atkarsk lodging (hotels, apartments etc.) immediately. Located in Atkarsk, Hotel Kareta has a terrace and a bar. Boasting a 24-hour front desk, this property also provides guests with a restaurant. Set in Kalininsk, Guest House on Chekhova offers free WiFi. The accommodation provides a 24-hour front desk and a shared kitchen for guests. Featuring free WiFi, Отель Ковчег is set in Kalininsk. All rooms in the hotel are fitted with a flat-screen TV. Offering a barbecue and children's playground, Hotel Tourist is situated in Shevyrevka, 20 km from Saratov. Guests can enjoy the on-site bar. Located 9 km from Saratov city in Shevyrevka village, this hotel features a sauna and billiards. Rooms at Motel Myasoyedovskiy include a seating are with a flat-screen TV. Situated 21 km from Pokrov Church, Motel Saratov provides free WiFi. Museum-Estate of Borisov-Musatov is 22 km from the bed and breakfast. This motel is located on Saratov Ring Road and offers a garden with a pond and peacocks, a sauna and billiards. A car wash and a 24-hour reception are featured at Autocamping Saratov. Mirage Hotel is located in Saratov, in a quiet residential area. It features an indoor swimming pool and a fitness centre. Offering a restaurant, Hostel Sokurskiye Dali is located in Saratov, 2.5 km from Volsk-Saratov Highway. Situated in Saratov within 12 km of Pokrov Church and 13 km of Museum-Estate of Borisov-Musatov, Отель Квартал offers rooms with free WiFi. 13 km from Saratov Academic Theatre of Opera and Ballet, the property is also 13 km away from Saratov Art Museum Radishchev. Loft Apartment/7 Lampovaya is located in Saratov, 9 km from Pokrov Church and 10 km from Museum-Estate of Borisov-Musatov, in an area where hiking can be enjoyed. This property is 10 km from Saratov Academic Theatre of Opera and Ballet. Apartment Elektronnaya 11 offers accommodation in Saratov. 12 km from Pokrov Church, the property is also 13 km away from Museum-Estate of Borisov-Musatov. Новая квартира на Мира in Saratov features accommodation with free WiFi, 8 km from Pokrov Church, 9 km from Museum-Estate of Borisov-Musatov and 9 km from Saratov Academic Theatre of Opera and Ballet. The Saratov Art Museum Radishchev is within 9 km of the apartment. Loft Apartment/30A Lunnaya offers accommodation in Saratov, 7 km from Pokrov Church and 8 km from Museum-Estate of Borisov-Musatov. This apartment offers air-conditioned accommodation with a terrace. Boasting barbecue facilities, Guest House Zolotaya Podkova is located in Saratov and is 12 km from Museum-Estate of Borisov-Musatov. With a garden, the property also has a terrace. Located in Saratov, within 11 km of Saratov Academic Theatre of Opera and Ballet, Blinova 19 is an accommodation offering city views. The property is 11 km from Saratov Art Museum Radishchev and 12 km from Lipki Park. Offering an indoor pool, table tennis and a sauna, Sokol hotel is located in Leninsky district in Saratov. Free Wi-Fi access is available. 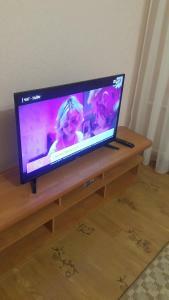 Located in Saratov, 12 km from Pokrov Church and 13 km from Museum-Estate of Borisov-Musatov, Котедж provides accommodation with amenities such as free WiFi and a flat-screen TV. The villa is 13 km from Saratov Academic Theatre of Opera and Ballet. Set within 6 km of Museum-Estate of Borisov-Musatov and 7 km of Museum-Estate of Chernyshevsky, Guest House on Oktyabrskoye Ushchelye 1 features rooms in Saratov. The property is around 7 km from Pokrov Church and 8 km from Lipki Park. Located in Saratov in the Saratov region, ApartmentSapernaya has a balcony. This apartment is 7 km from Pokrov Church and 8 km from Museum-Estate of Borisov-Musatov.